Coastal Business Supplies, Inc. is excited to announce to our customers the release of the new Epson F2000 Direct to Garment printers. We are excited to show you the advances in technology and the hard work that Epson has put into this machine. We have spent years saying that DTG was not ready for the masses and we are excited to finally be able to change our tune. Some of you already know that I personally (prior to my time at Coastal Business Supplies, Inc.) have had extensive experience in the inkjet to garment world. For those of you who don’t know me, let me give you a little history of my experience with the direct to garment (D2) world. Back in 2000, I began working at U.S. Screen, which was my entry into the garment decorating world. At the time, U.S. Screen was primarily involved with screen printing and we promoted training videos, classes and a color separation software. 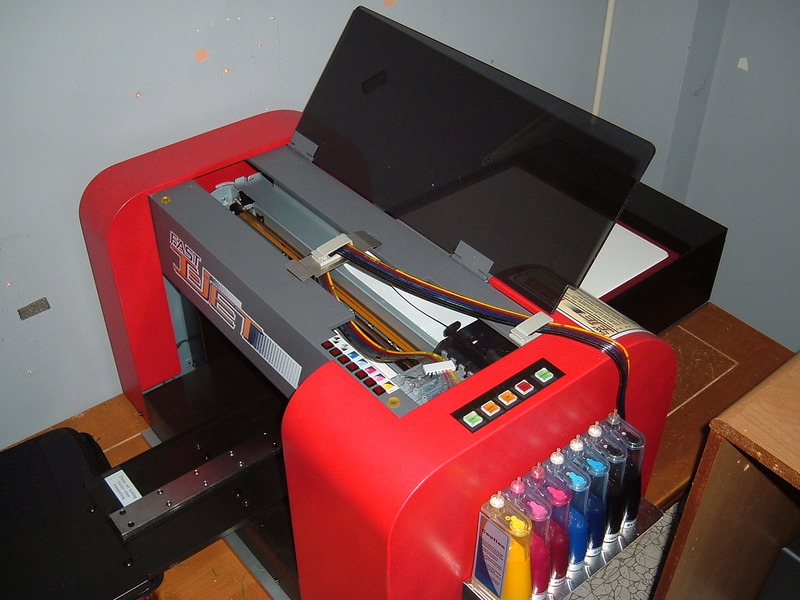 Then in 2004, we went to the SGIA show in Minneapolis, MN to display a new product that we thought would revolutionize the screen printing world. It was a direct to screen inkjet printer. Unfortunately, that product was a bit ahead of its time, but off in a corner near the direct to screen machines was the T-Jet machine getting lots of attention. That printer evolved and helped U.S. Screen to become listed as the 12th fastest growing manufacturing company in the United States (by Inc Magazine), as well as, Inc Magazine’s 537th fastest growing companies in the Inc 5000 in 2006. As you can see, the rapid success was a wild ride for me and one that has proven to be very valuable personally over the course of my career. Despite all of the success, U.S. Screen went out of business in 2009, a large part due to that little T-Jet machine that was sitting over in the corner of the 2004 SGIA show. The Auction Truck picking up the pieces as U.S. Screen went out of business in 2009. The technology was cutting edge at the time and at several critical junctures was also on the bleeding edge. It was basically an off the shelf Epson machine that was torn down and retrofitted to be able to print directly onto a t-shirt. In the beginning the machine was great, but it only printed on light garments with a mixture of CMYK inks. It ran right off a standard Epson driver and truly was as simple as pushing print from your computer. 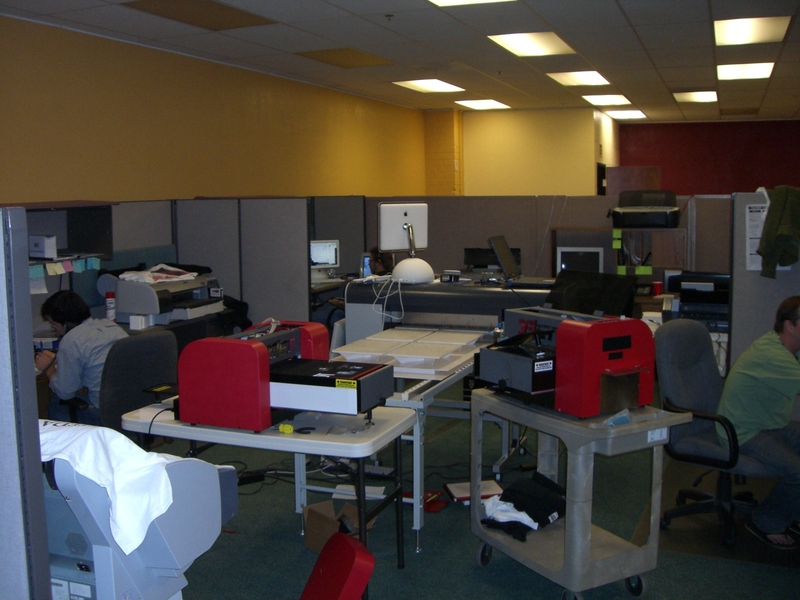 Then, U.S. Screen began developing a white ink printer that started as the Pro HV unit, selling for over $250,000. This technology got the white ink to a point where we were able to put it into the T-Jet 2 machine. At first it took pretreating the shirt, 3 or 4 passes of white ink, a layer of CMYK and then additional highlight white. This process took 6 to 10 minutes to print one shirt, but it worked. What we soon discovered by adding white ink to the mix everything changed. The bulk system tubes had to be made bigger to get more white ink flowing, a RIP software had to be added to get the print head to open up and pump a ton of white ink onto the shirt. Even with the RIP, it still was not enough white ink and we were pushing the print heads to the max. Again, the whole time an off the shelf Epson was being used as the guts of the machine. All that extra ink and abrasive Titanium Dioxide white ink caused ink build up and extra wear and tear on the print heads. An excessive amount of maintenance was needed to be done to keep the machines running, noting many people were not doing that maintenance because they paid $15,000+ for a machine and were “sold” a magic bullet. On top of all that, the pre-treatment that I mentioned earlier, actually caused the ink to start curing on the shirts. What began happening was people were pretreating too close to the machine and it would cause the ink to start curing in the machine. This was causing an additional expense with many blown or clogged print heads to replace. All the while, Epson was working on new printers in the space that we were taking the off the shelf printers from and it was very difficult to keep up. The real last straw was a falling out with the base manufacture from Japan. This caused U.S. Screen to come out with the T-Jet 3 which proved to be the downfall of U.S. Screen. The technical support area for the T-Jet. These guys were busy. In 2006 there was a lot of competition in the space as U.S. Screen and the Epson based machine were slugging it out with Brother and their direct to garment machine. The Brother machine did not use Epson print heads and in my opinion didn’t print near the quality of prints you could achieve with the Epson print heads. Most of the customers at that time who really needed and understand what it took to be successful as a direct to garment owner, had a printer of choice and the hype was pretty large. Now the low hanging fruit was gone and the overselling of the equipment took off. It was a pretty ugly time and around 2008, I left U.S. Screen as I just could not handle some of the difficulties that were being created for some very good people. I moved to Boston to coach volleyball and get away from the industry. Lawsuits were starting to be filed against U.S. Screen and I was convinced that direct to garment was just not ready. Due to the economic state at this time, no one was really innovating. DuPont had won out on the ink for most of the industry and had decided to no longer improve the ink, as they had no real competition. I was happy to be away from the ugly mess that was direct to garment printing at the time and wanted to stay as far away from it as I could, cringing when I heard the name T-Jet from people. In July 2010 I made the trek to St. Louis, MO after meeting the Pickering’s who own Coastal Business Supplies, Inc. Learning about the company, what they stood for and the fact they had nothing to do with direct to garment were some of the things I loved about the company. They didn’t want to get into the D2 world based on all the horror stories they had heard. They were too service oriented to get behind a product like that. 2013 we were (and still are) selling the Epson F6070 and F7070 Dye Sublimation Printers and Epson invited us to attend Print 13 in Chicago. We jumped on a plane and went and saw this machine in action. I was very skeptical of it based on my past history, but came away from that meeting with renewed faith that direct to garment printing was finally going to be ready for the masses. Today, Coastal Business Supplies, Inc., has been asked by Epson to also represent the F2000 Direct to Garment Printing machines (available in white and color versions) and have done so with much excitement! We are able to offer a product that we as a company can stand behind and shout to the world – Direct to Garment is ready for prime time! I believe that Epson has solved most, if not all, of the problems people have had over the years. On top of that, it is the fastest machine in its class and you can barely hear it run. Epson has spent over 3 years researching and developing this printer. It has been built from the ground up. This is not someone else’s print head being thrown into a machine with someone else’s inks, this is Epson from head to toe and the ink and the print heads are made to specifically work with each other. The printer can print over 81 shirts per hours on light garments (with the color edition printer) and over 35 shirts per hour on dark garments (with the white edition printer). This would be typical 8 x 10 images and those times include loading the garment and entering the printer, actual printing of the garment, then exiting of the garment for removal. These are actual production capable times, not just the print times that many other machines list. The machines are also fully warrantied, including the print head. They require no tools to perform standard maintenance and in general has fewer maintenance needs. No other machine really can be compared to this quality product. Check it out and request more information at our Direct to Garment Page or email me directly at aaron@coastalbusiness.com. After repping PaP in Idaho for many years, we had DTG printers in the development and tech support shop assessing whether we should offer them for sale. It was clear that the DTG home-based operator either loved or hated their DTG machines. The difference was whether or not they used them on a daily basis or upon occasion -as most do- The maintenance and breakdowns were simply too much for the average user, for reasons Aaron discusses here. If it isn’t simple to use, rarely is it profitable to use. So, at PaP, we decided it would be a tech support nightmare to sell the older state of the art of this technology. Accordingly, I am happy to see that Coastal has so carefully vetted this new system out and that we can all now have confidence in it. At last, the dream of ultimate convenience and profitability comes to shirt decoration. Next Next post: Product Review Contest – Win a $25 Gift Certificate!